[/caption] As you can see there was plenty of sunshine when I took this picture. This was taken on the same day that I climbed Kings Mountain earlier in the morning. The weather was much different later in the afternoon. In fact, the sun was so bright that I really had to work to get some pictures along the Wilson River with the waterfall in the background. Both the river and the waterfall were almost directly in the sun so I decided to try something a little different by using the direct sunlight to my advantage. I either had to find something to stand behind whenever I found a good vantage point or I would stand some place when the sun was temporarily blocked by one of the massive trees high in the hills. The Wilson river flows right along Highway 6 towards the coast. There are several great places to take some pictures. There are also plenty of hiking trails to take so you can have hundreds of opportunities to get some pictures of the river and the forest in the background. I chose this spot since this waterfall was crashing towards the river just above the waterline. The Highway is just above the top of the waterfall. You can see the stones just to the right. The waterfall is also coming out of a large aluminum pipe so I made sure that it wasn’t in the picture. There is also a really nice waterfall on the other side of the Highway with a trail going to its base. You just need to cross the Highway and walk about 200 yards. If you park at the day use area you can walk on a trail that parallels the Highway and then cross a suspension bridge that takes you directly to the waterfall and a popular swimming hole during the summer. However, the river is really raging in April and the rapids looked like class 3 to me. To get this shot I set my shutter to only .5 seconds since the sun was so bright. The F stop was at F/9 and the ISO was at 100. I used my 18-55mm lens and set it at 37mm focal length. I also had my warming filter, ND8 and my CIR-PL attached. There was no way to use the shutter without stacking as many filters as I could. I almost added my ND4 as well but that was too many. I also used my tripod. [/caption] Friday was a great day to hike to the summit of Kings Mountain. However, the weather during the afternoon was much better than the morning. And I chose to hike to the 3226′ summit during the morning. It was cold, windy, rainy and very overcast for most of my hike. I was able to get this shot at a time when the sun was barely poking out for just a few minutes but for the most part it was pretty nasty. There was still some snow hovering around the higher elevations and it was a little slippery near the cliffs at the edges of the summit. This is the second time that I’ve hiked to the summit of Kings Mountain and it’s not for the fainted heart. It’s a grueling 2.5 mile hike straight up towards the summit with 2780 feet of elevation gain. 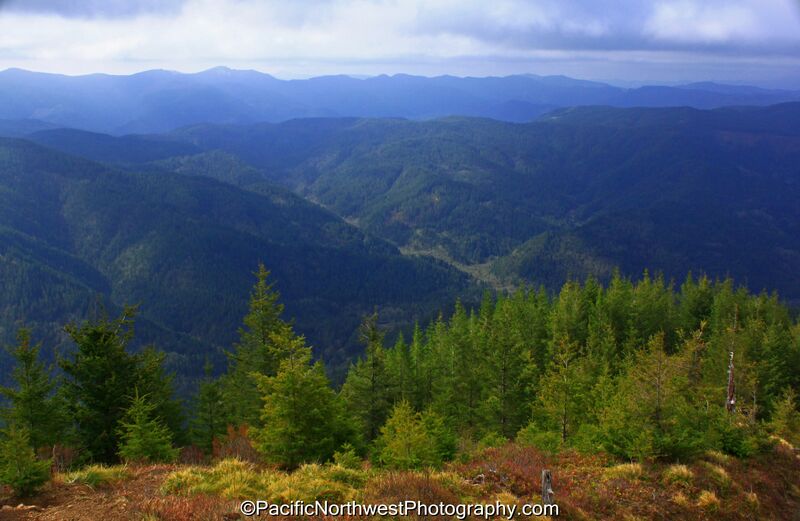 This is probably one of the best vantage spots to gaze out towards the Coast Range with views in all directions. Some of the spring flowers were starting to come out but it was still a little bit early with very few wildflowers along the upper ridges. To get this shot I made sure that I was using my tripod since the wind was pretty bad. I used my 18-55mm lens and the focal length was set at 24mm. The F stop was set at 8 since it was pretty gray with limited light. I set the ISO to 200 and I used my warming filter as well as my CIR-PL. This is a great hike so I will be heading up again as soon as the weather improves and the wildflowers are at their peak. The Wilson River is also just below the trail with several other trails and picnic areas nearby. There are also several small to medium sized waterfalls close by. [/caption] This hike along the Washington side of the Gorge is one of the best trails along the northern part of the gorge. 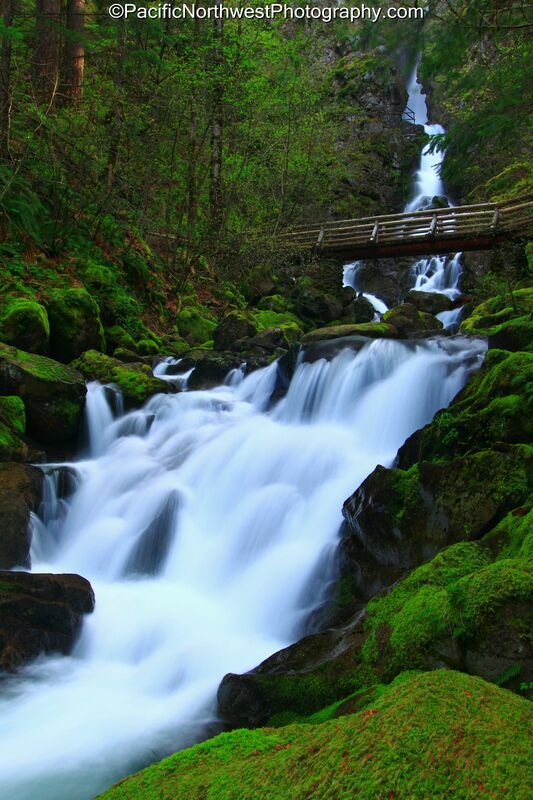 There are two amazing waterfalls and the scenery from the top of the trail are stunning. You can see Mt. Adams and Mt. Hood as though you can almost touch them. The trail to the summit of Hamilton Mountain is a grueling 7.6 round trip hike and gains a total of 2,000 feet of elevation gain. 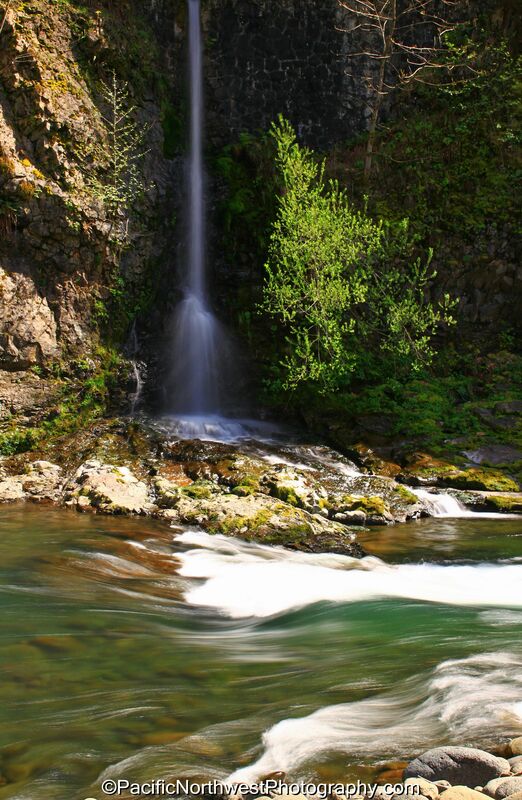 There are several sure drop views along the trail and you are welcomed with some of the most stunning views of the gorge. I wouldn’t recommend this hike if you’re afraid of heights or get dizzy easily. You can sometimes hear the distant sounds of gun fire from the nearby shooting range and the Bonneville Dam can be somewhat of an eye soar. Though I still think that the views are still worthy of this challenging hike. Hardy creek is one of the most scenic creeks and I really enjoy photographing this area. On this hike, I decided to only hike to the bridge that crosses Hardy Falls since I was planning on an additional hike the following day. I had climbed down from the bridge and carefully navigated my down along the creeks edge. The rocks and moss made it challenging and I eventually found out that my hiking shoes still keep my feet dry when I slipped into the creek. I ended up planting both feet in the creek when one of the many rocks rolled as I stepped on it. The morning was mostly overcast and it rained periodically but the sun eventually came out as I settled on this photo to post on my blog. Again, the water was thundering from high above and the moss was just starting to show its neon green that makes it famous around the gorge. I had to set up my tripod on a very narrow rock and plant my feet at the very corner of the creek. I used my 18-55mm kit lens and set the range at 18mm. I set the shutter speed to 1 second and the F stop at 18 since the glare from the creek was pretty high. I set the ISO to 100 and kept the sensor at Program mode. I used my warming filter as well as my ND4 and CIR-PL filter. I have hiked this trail several times and I would recommend it to anyone that wants to get a grand view of the gorge as well as two volcanic mountains. [/caption] I spent a fantastic day at the gorge yesterday. This time I wanted to take some pictures of the falls while the sun was out. I was hoping to get some great shadow features in my shots and I wasn’t disappointed. I decided to post this picture since it shows just how fast the water was moving and it details how diverse the vegetation is. This isn’t my favorite shot but I thought it summed up my day pretty well. The water was moving with so much force that I had to reduce the shutter speed in order to avoid the heavy glare from the sun reflecting off of the water. 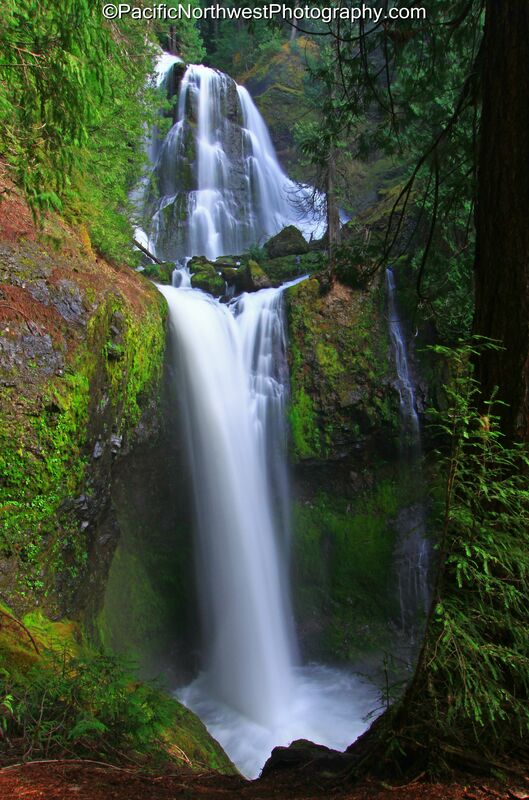 The water is currently thundering down from the Cascades with unbelievable force. If you look closely, you can see that the creek has spread to every nook and cranny of the basalt, winding it’s way towards the Columbia river. Now is the best time to see this in it’s rawest form. However, some of the vegetation still hasn’t come out. Also, many of the spring flowers are starting to bloom. I would give it another week or two before all of the neon greens break through the soil. To get this shot I stood behind a tree in order to block some of the suns light. I set my shutter speed to one second and set the F-stop to 8. I used my 18-55mm lens and had to use the 55mm focal length since I was standing high above the falls. I set the ISO setting to 100 and used my tripod, as I always do when photographing moving water. I’ll be posting several more shots on my business facebook page. 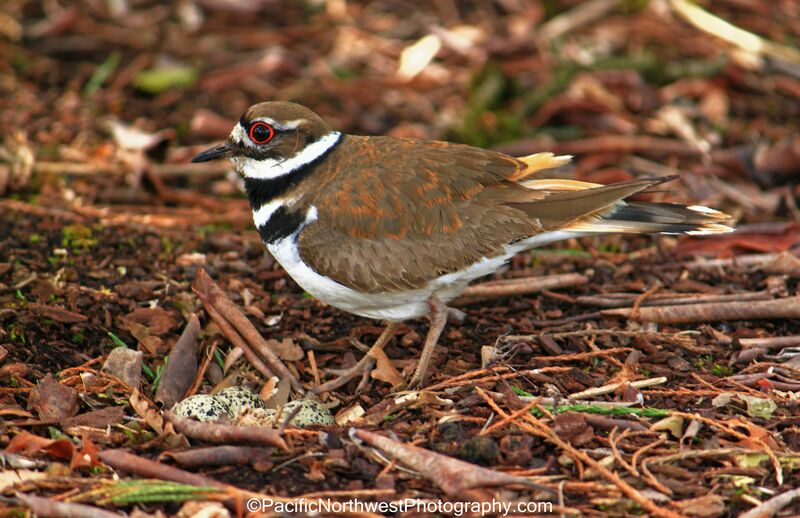 [/caption] While taking photos at a local park, I had come across a killdeer and it’s four eggs. Since there were so many people gawking at the bird and it’s eggs, mom was having a hard time luring away the many strange faces staring at her nest. It was interesting to see how many times she tried to lure people away with her fake broken wing. I decided to post this photo since it was one of the few times that she was standing still right above her nest. I was standing about 5 feet away and used my 55-250mm telephoto lens at 250mm focal length. I removed my CIR-PL but kept my UV filter and warming filter to bring out the warmth of the brown colors. The F stop was at 5.6 and I set the ISO to 100. I used Auto exposure and I didn’t use a tripod. If you look close you will see that she has four eggs. I normally don’t take pictures of wildlife but this was a great opportunity and I couldn’t resist from taking these shots. I’ve seen several killdeer and even stumbled across one with it’s eggs but I’ve never been able to get this close with my camera in hand. [/caption] I couldn’t help but return to the Woodburn tulip festival again. 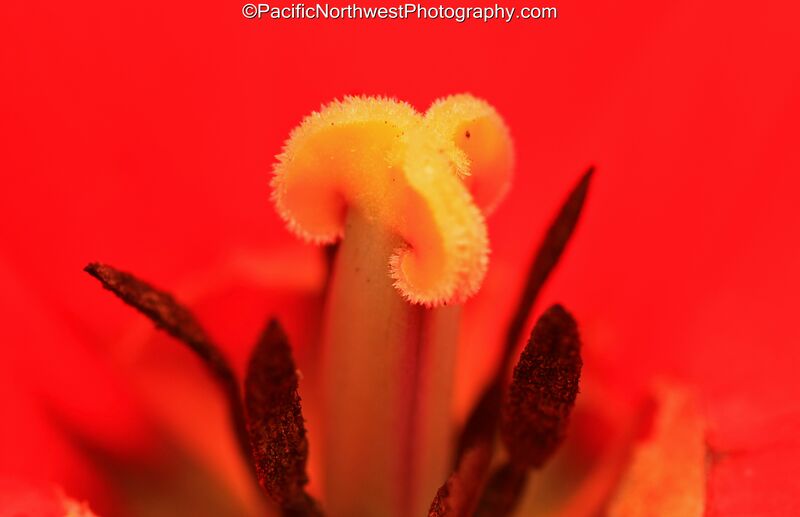 This time I wanted to concentrate on macro shots and photographing the many insects that pollinate the flowers. I tried to look up the names of the insects but it seems tulips are pretty complicated little guys. I believe the Syrphid Fly is one of the main pollinators. I took several pictures of them. However, I decided to post this macro shot taken from the side. The pedals on this tulip had fallen off, which allowed me a great opportunity to get this shot. It clearly show’s how intricate and diverse these flowers are. However, most of my macro shots were taken from directly above the tulips. 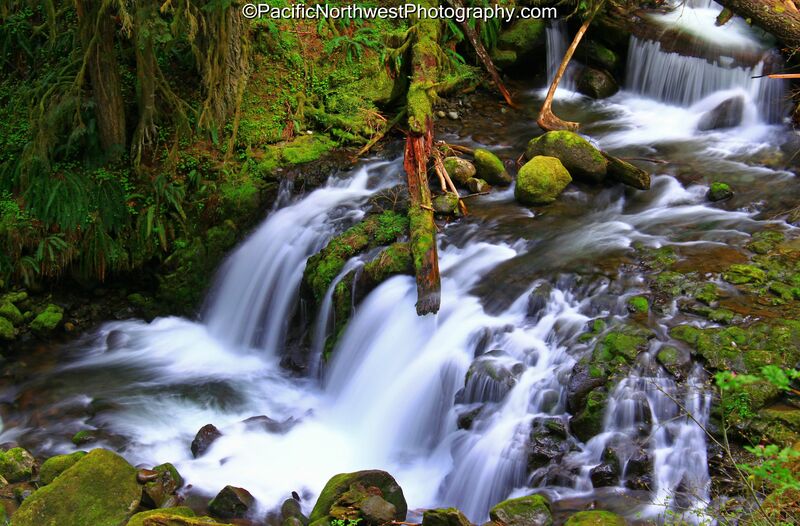 You can view some of them on my business facebook at PNW photography LLC. Again, I used my 50mm macro/prime lens and attached a warming filter along with my UV fiilter. I kept my setting at auto which increased the F stop to 4.5 and I set my ISO at 200 since it was pretty overcast. I didn’t use a tripod. It’s very difficult to get some of these shots without crouching and my tripod was just to cumbersome and time consuming. [/caption] I decided to post this picture on my blog in order to show just how great the day was. 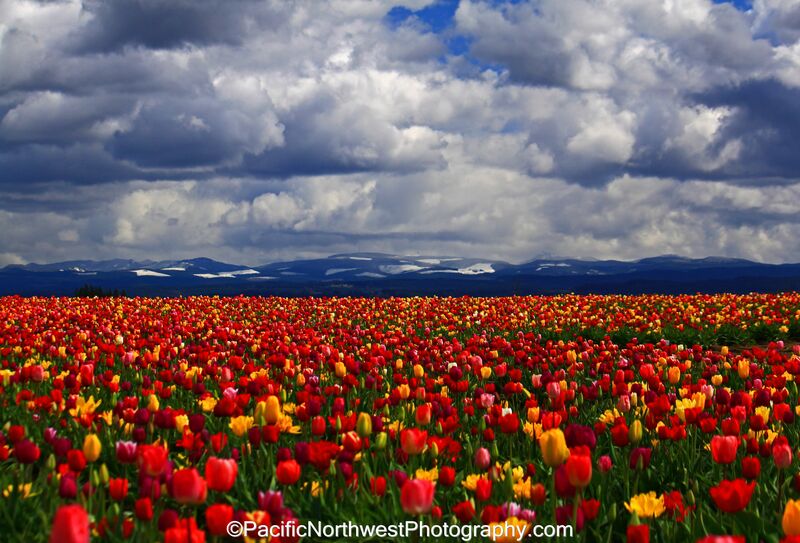 This has tulips, snow in the mountains and incredible clouds. This isn’t my best or favorite that I took but I really wanted to show off just how incredible the scenery was. I may not have taken the best photos of a tulip farm but I’m sure there aren’t very many photographers that have a combination of the three in their portfolio….Except for the other photographers that were here the same day as me, of course. The entire day was spectacular. On this shot I had set my camera to normal exposure. The F stop was set at 7.1 since the clouds were changing constantly. Sometimes the clouds would obscure the sun but then it would suddenly appear and drown out the color of the tulip filed. The focal length was at 55mm. I used my warming filter and CIR-POL on each of my lenses. I used my 55-250mm telephoto lens throughout most of the day. the ISO was set at 100. I made very little changes while using photoshop. Mostly I just darkened the clouds when needed and occasionally cropped a little, in order to take out some of the people. I was able to use all of my lenses pretty regularly all day while photographing….18-55mm, 55-250mm, 50mm macro/prime lens and my 18-24mm wide angle lens. I would highly recommend a trip to the festival if your in the area. A lot of the tulips weren’t even out yet so I’m sure that the rest of April will be even more spectacular. It’s also a great place to bring the kids and there is plenty of food. I plan on returning as much as possible this Spring.